Problem Description: My horse kicks the door/wall and the QuitKick unit does not activate. Most Likely Solution: Batteries need to be recharged or replaced. The QuitKick System battery needs to be recharged fully on a regular basis, even if you don't see your horse kicking any more. If the battery is allowed to run completely down, it may lose the ability to hold a charge at all. This is particularly true in very cold or very hot weather, as batteries tend to lose power in extremes - either hot or cold. Make a habit of recharging your QuitKick unit for at least 8 hours once per week during moderate weather periods, and twice per week when temperatures dip below freezing. Tip: you can purchase an extra system battery and clip charger so that you can swap a fully charged battery in while the second battery is charging. For step-by-step instructions on how to change your system battery, click here. In the case of a Total Stall System, you might also need to replace the sensor batteries. If you observe that the sensor light goes on, but the main unit does not spray, this may indicate that the sensor battery has enough charge to activate the LED, but not enough to send the radio signal to the main unit. Solution: Replace the sensor batteries. Note: QuitKick sensors require a 3 volt Lithium AA battery. Standard AA batteries (whether Lithium or Alkeline) only have a 1.5 volt charge. Problem Description: The QuitKick System seems to activate for no reason. Solution: Replace your sensor batteries. QuitKick sensor batteries are NOT standard AA batteries; standard AA batteries cannot be substituted. Click on "Extra and Replacement parts" in the QuitKick online store to order replacements. 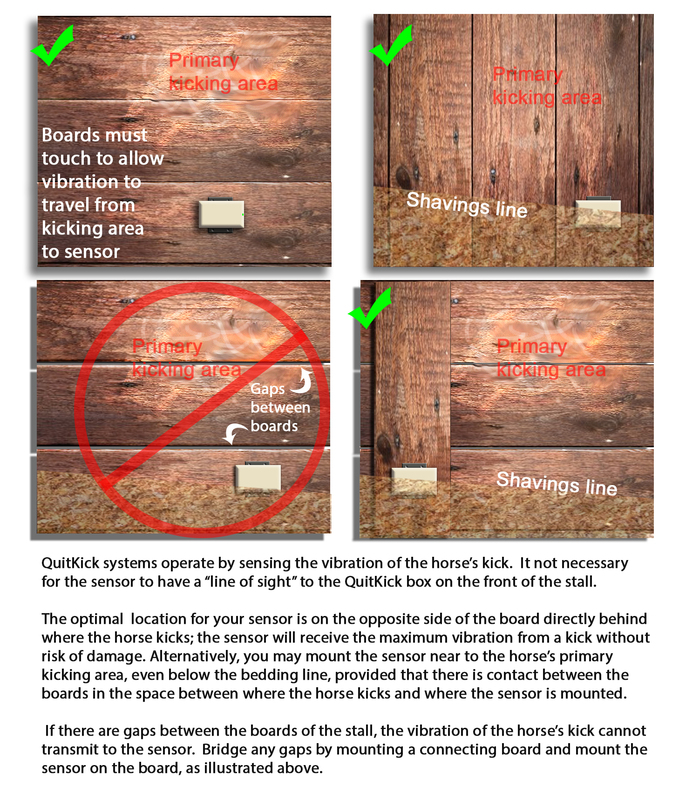 QuitKick systems operate by sensing the vibration of your horse's kick and sending a radio signal to the unit mounted on the front of the stall that sprays the water. For optimal performance, you must locate the sensors where they will easily receive the vibration caused by the horse's kick. The best location for your Total Stall System Remote sensors is on the opposite side of the board that your horse actually kicks. If that location isn't an option, either because you have single wood partitions and a horse in the next stall, or you have double partitions, making the back side of the board your horse kicks inaccessible, the next best option is to locate the sensor below the bedding line near where the horse kicks.